Rabbi Yehuda Ben-Yishai, Ruth''s father, spoke of his deceased grandchildren: "Hadas, the littlest, she was everything: cute, beautiful, close to her mother." Hadas Fogel was buried at the Har Menuchot Cemetery in Jerusalem alongside her parents Udi and Ruth, and brothers Yoav and Elad. 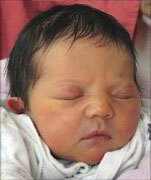 She is survived by her siblings Tamar, 12, Ro''ie, 8 and Yishai, 2.